Finally. Yes, finally. As you no doubt are fully aware, Godzilla is invading America. And it only took 'em 50 years. Which got us thinking (something has to, right?) what other Japan only cars are we hot for? Sure, everyone wants the last gen Evo wagon or a Civic Type R, but really, what makes you ache? 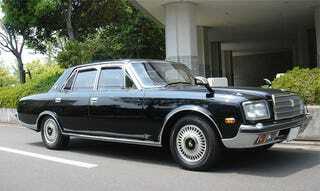 Well, for us the answer is painfully simple: the Toyota Century. It's 40 years old and even after a major redesign in 1997, it still looks the bleepin' bloody same. And we find it super hot. There's also the matter of the 5.0-liter V12 good for 276 HP. Did we say 276 horsepower? Oh, that's the official number. What we mean is 350+ hp (thanks Carter). Plus window doilies, as tinted windows attract undo attention. But that's us. Which car from the Japanese domestic market do you want Santa to cram up your stocking? And sure, you can pick the Mud Master. Why the heck not?